Hey everyone. It had been a few years that I last played it when I got back into Shadow of Chernobyl a few months back. I was just about ready to move to the Army Warehouses when Christmas came around and I stopped playing. Instead I used some of that time to adjust the balance of economy and weapons one more time. I only started playing again a few weeks back. I thought I could use the opportunity to report on some of the interesting occurences I've had. And things I should have noticed in previous playthroughs but didn't. - Apparently Nimble leaves the rookie village once the battle with the Mercs is done. No wonder I didn't notice that since in my recent playthroughs he always decided to keep sitting at the campfire till the Mercs were on him. - Wolf has been killed at the southern Bar entrance. I have never observed any part of his journey so I was quite surprised when I found his corpse. At this point I was almost ready to believe that he simply gets teleported to the Army Warehouses. - Never noticed that some of the Snorks at the Yantar factory are waiting for the player to move in the building right to the left of the entrance. Noticing them through the gap in the door I was able to take down two of them easily this time. I'm frankly not sure if I have ever even entered that building in any of my previous playthroughs. - I'm still playing around with my game-files and it has made a real difference in some cases. For example, when I started my playthrough a few months back, I quickly ran into problems with medical items since it was balanced for the later stages of the game, not for the early game when the player is short on everything. One thing that has certainly worked out great is that Anti-bleeding artifacts are now a real blessing. When I last tested it I was always on the verge of running out of bandages. - And 5,56x45 mm-ammo: I have changed the LR-300 (Trs 301) quite a bit, so that it seemed to make more sense to let it use 9x19 mm-ammo. I have only recently managed to change the type of ammo the NPCs spawn with. This has now led to there not being all that much free 5,56x45 anymore. - I have noticed that that Trenchcoat-wearing person that is armed with a Val (VLA) has only recently left the Bar, but I'm quite sure that I have never seen him anywhere. - Also, concerning the Storming Abakan: I usually find it in the hands of a bandit either in Agroprom underground or in the Dark Valley-banditbase, but this time it was just lying around near the entrance to the Agroprom underground. I guess, some bandits might have run afoul of the mutant population. Also likes to bathe in Fruit Punch and to get savaged by Bloodsuckers. Always happy to hear stories of people returning to the Game and seeing things and finding out new ways to do things they didn't see/do before. There's so much replay-ability in the Game without extreme Modding. I can definitely say my Playing style has evolved over the years. I used to think an Exoskeleton was the way to go, to carry everything and walk around like a tank. After playing Clear Sky and Call of Pripyat, I could never move that slowly and be weighted down ever again. ❖ Nimble can be caught running back and forth from the Car Park where you rescued him, to the Rookie Village. Eventually he usually falls victim to Bandits, Military or Mutants. ❖ Wolf physically walks from the Rookie Village to the Army Warehouses. He's usually safe in off-line mode as he travels and only when he goes on-line ( by you getting in PDA range ) can he be killed on the trip by Men or Mutants. Wolf starts this journey as soon as you grab the Military Documents in the Agroprom with that action opening the gate to Rostok in Garbage at the Duty Checkpoint. You can actually track his journey on your PDA. First, before you do the Agroprom, take one of the jobs from Wolf he offers and your PDA will show his position for you to return to him for your reward. You only have 24 hours for this to work before it expires. Next rush to the Agroprom, do your business and then after grabbing the Documents, start watching his movements. He's been reported killed in Garbage and other places along the journey. Being killed early does not affect the Game as the dynamite he's supposedly carrying to Colonel Skull ( as told by Fanatic ) always gets there somehow. ❖ Did you mean the building on the right of the gated entrance? There's no building on the left. Just some walls and pipes. Unless you meant the building farther back in the corner on the left. Both sides usually have Snorks hanging out. Both sides have stashes to discover including both buildings. You should always search every location. ❖ The hardship at the start of the Game is what makes it so fun. Not enough medkit or bandages ( makes you have less risky Rambo type behavior ) not enough ammo ( teaches you to conserve and not spray bullets ) no good artifacts yet ( teaches you not to sell them when you get good ones to use ) to help you out. Of course if you Mod your Game and give yourself everything, then you learn nothing except how to make the Game too easy. ❖ In the southern stretches of the Game, 5.45 ammo is common and best to use those weapons that shoot it. North of Rostok you will come across Freedom, Monolith and Mercenaries with 5.56 and it's good to switch to weapons that you can loot ammo as needed. Of course if you decide to buy ammo, you can do anything. Sadly there are a lot of unique weapons found in the Game that are usually so damaged you can't use them for long or at all. Some of these use irregular ammo like the Viper found in the Garbage train tunnel that uses 9 x 18. ❖ The Trenchcoat Loner in the 100 Rads Bar comes and goes as do some of the others. There is no back story on him even though I wish there was. You will never find him anywhere else. ❖ After you wipe out the Agroprom Underground Bandits, Friar ( carrying the "Storming Obokan" ) and others will leave the Dark Valley and walk to the Agroprom Underground to replace the crew you killed. Again this is like Wolf for different things that can happen depending on if the travel is off-line ( safe for him ) or brought on-line by the Player's proximity. Other Players have reported finding and killing him in Garbage. Once you give Brome the "Storming Obokan" to complete his task, you can take an IL-86 or TRs-301 ( you have to put ammo in them ) and drop them next to Brome as you stand next to him. Brome will drop the "Storming Obokan" and pickup the other. You have to grab it quickly because Brome can change his mind if you are not fast. This can be repeated for additional rewards but eventually Brome can get tired of this and not want to give up the "Storming Obokan". If you want to use it, you can, wear it out then give it back to him. Please keep us updated and Good Hunting Stalker. Messages: 135 Thanks as always Tejas. 1. Nimble: Ah, well then it's good that I at least made sure to sell him an AK74 and some ammo. Maybe it'll help a little. 2. Yep, I'm aware of the basic concept of offline A-Life and online A-Life, but in a lot of cases I'm simply not aware how things work exactly. For example, I have no clue where Scarecrow (exo-guy with a unique IL86) comes from when he shows up in Wild Territory after the X-16 device is turned off. I have never seen him in the game before that point. 3. Yeah, I meant to say "right to the right of the entrance". Cleaning that whole area of Zombies and Snorks did work out pretty well this time. Maybe because I really took my time to move forward slowly and methodically. Also made sure to use the Fora to headshot Zombies so as to not waste Abakan-ammo. I still ended up burning trough all of the buckshot for the Winchester (Chaser) though. I'll never be any good at taking down Snorks. 4. Definitely. This playthrough I tried to get the stash on top of the traincar wreck early. I did equip the Thorn I had found and promptly managed to jump through one of the Springboards causing massive bleeding. I managed to get back down completely irradiated and badly bleeding, close to death. I quickly applied some bandages, but I didn't yet have any Anti-Rad so I downed three Vodkas and then equipped my Stone Blood as I made my way back to the Rookie Village while swaying uncertainly. 5. Ammo is one thing which I've tried to make more expensive, but I almost never need to actually buy any. Though almost never is still better than never, as is the case with everything else. 6. Interesting, so the Bar people are simply dis/appearing? 7. So they don't always leave at the same time? I'm pretty sure that I often kill that particular bandit in the DV-bandit base. I might be imagining it, but I had the impression that Barin also left the Bar earlier than he usually does. I grabbed his Tunder 5,45 and used it for much of the storyline stuff in DV. Scarecrow typically wanders around the Army Warehouses until you open the Loner camp in the Wild Territory building formerly occupied by Wolfhound through completing the "Meet Kruglov" portion of the X16 docs mission. Barin starts out with a job patrolling Rostok but then loses it and starts wandering to randomly selected points in the level (while glancing from side to side, a behavior that denotes an NPC with no job and nowhere to go) from what I've seen. If he isn't killed while wandering he'll eventually move on to a slot in a Duty camp once the player opens it, usually the one at the Dark Valley entrance after the player hands the X18 docs to Barkeep. I've seen him go to the WT as well in a game where I went there before the DV. 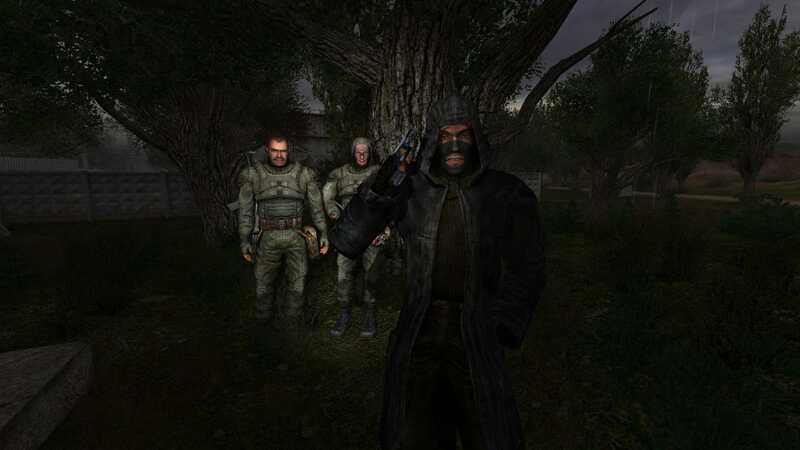 Friar stays in the DV Bandit base until the player opens a slot in a camp that accepts Expert-ranked Bandits, which are located in the Agroprom Underground and the Wild Territory. Poker behaves similarly but doesn't switch online until you get Borov's key to X18, which often leads to him going to the WT if you don't make additional trips to the AU. Of course untimely deaths of the abovementioned or similarly ranked NPCs in camps, completing objectives out of order, or perhaps even sheer randomness can derail these behaviors, but generally this is what I've seen when going through the normal progression in a timely manner (with vanilla or ZRP, and even Complete once too [unfortunately]). Hope that helps, I could probably rattle off a few others if necessary. Ah, the Army Warehouses, makes sense considering the lack of exos in other areas. Yeah, when Barin doesn't manage to get himself murdered by the dogs south of the Bar - which he does most of the time - then he has shown up at both places for me. Interesting, I don't think I have ever "met" Poker in the Wild Territory. By the way, usually Bes, Seriy and Fiend get themselves killed quite reliably, but this playthrough only Seriy has met his usual fate. Bes got wouned during an attack on the bandit camp in the southwestern Garbage, but I saved him and he is still there. And Fiend has managed to not get eaten by the Vehicle Graveyard-Pseudodogs for once. He is with the Duty-blockade in the Wild Territory now. Poker often winds up in the WT in my games, guarding the tunnel where Bandits and Mercs meet. A quick post-X18 trip to clear bandits in the the AU could probably redirect him that way though, as the AU is a better location for him in regards to Voronin's "Neutralize the bandit" mission. I've had to sprint past him in the tunnel more than a few times in order to get the mission from Voronin. Seriy can hang in there for a while (with a little help) if he picks a spot near the east-facing entrance of the hangar. Bes is totally doomed in vanilla due to endlessly insta-spawning bandits, dogs, and the murderous campfire, but is fairly savable with ZRP and its derivatives (like Complete). Fiend's a bit special though, he starts off with a job patrolling Rostok and is released from it after X18 completion (anyone wanting to complete Sid's assassination mission for him would do well to take it right before going to the lab). Being of Veteran rank there aren't many camps available to him at that time, so the Vehicle Graveyard is a common destination. If Bes' camp was full in your game or you went to the WT early it could explain him ending up with the WT Dutyers. Messages: 135 I have in fact found both Poker and Friar in the Agroprom Underground this time. Maybe not exactly surprising to people who have played the game quite a lot, but I remember only ever having met either one or the other down there. Did then nerf the Spas-12 a bit after that. I believe Poker one-shot me four or five times I had tried to balance its firepower with a smaller "magazine" and by making it handle badly, but in the end firepower is just a far more important aspect of a gun than these other factors. But of course, there aren't exactly a lot of close encounters with NPCs wielding Spas-12s in the game, so it took me a bit to fully realize my mistake. I have in fact found both Poker and Friar in the Agroprom Underground this time. Maybe not exactly surprising to people who have played the game quite a lot, but I remember only ever having met either one or the other down there. Poker's gun is a unique variant as well (the Threaded SPSA14), so no other NPCs will be wielding the weapon with those particular values unless they happened to pick the one he dropped. Messages: 135 Yep, it says that it's more accurate with slugs and darts, but the value for the basic fire_dispersion_base or however it's called is significantly better than for the base-version of the gun, which seems to suggest that shots with buckshot should also be more accurate. Should explain why - even after nerfing the damage by about 20 % - I can still often one-shot basic bandits at short- to mid-range. Yep, it says that it's more accurate with slugs and darts, but the value for the basic fire_dispersion_base or however it's called is significantly better than for the base-version of the gun, which seems to suggest that shots with buckshot should also be more accurate. Should explain why - even after nerfing the damage by about 20 % - I can still often one-shot basic bandits at short- to mid-range. It's a good gun. certainly better with buckshot than the original description would lead you to believe. A shame that it can only be obtained after Borov is killed, as there aren't many Bandits to fight in close quarters from that point on (aside from backtracking). The SPAS being around 1.5x the weight of the Chaser/Maverick always leads me to choose the latter though, since I mainly use shotguns for mutant hunting in SoC.